Menstuff® Events Calendar lists over hundreds of mens events through the next 12 months broken down by title, type, and date. While youth workshops are mixed in here, we've provided a separate calendar of just youth events at the end of Kidstuff. If you would like more information about any event, click on the title to see what we have. Also, see Men's Councils and Other Organizations that have regular monthly meetings. Interested in How to Start a Men's Group (Or Keep It Going)? All events presumed Men Only unless noted with a W&M. +R&B = + room & meals. +B = + meals. The vast continent of African contains a wonderfully rich diversity of people and cultures. Ceremony and ritual are vital elements of life, from the settled communities of the equatorial forest to the nomads of the desert. Coming-of-age ceremonies at puberty, courtship rituals, preparation for marriage, and seasonal festivities - all are marked with elaborate celebrations. By means of these rites, African men express their creativity and their roles within their cultures. The breadth and diversity of this expression encompasses, among other things, elaborate and colorful regalia, minutely detailed body paintings, and finely crafted beadwork from such diverse locations as Kenya, Ethiopia, Sudan, Niger, Mali, Nigeria, Ghana, Swaziland and Senegal. Inspired by their extensive knowledge and deep love of this great continent, Carol Beckwith and Angela Fisher journeyed from the homelands of the Hamar and Karo in Ethiopia to the Sahelian steppe of the Fulani and Songhai in Mali, and from the Nile swamplands of the Dinka in Sudan to the Sahara Desert of the Nigerian nomads to photograph the lives, customs, and ceremonies of the men of African. The stunning pictures make up an exquisite calendar and provide a glimpse into the exciting variety of African culture. 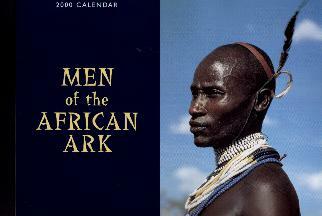 Men of the African Ark calendar, 2000, Pomegranate Communications, PO Box 6099, Rohnert Park, CA 94927 1.800.227.1428 or www.pomegranate.com Also available, Women of the African Ark.